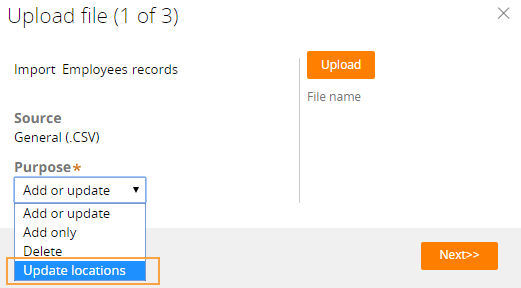 You can manage data import purposes, or reasons for importing data from .csv files that are available to users when they run the data import wizard. You can also disable or remove data import purposes. You can add data import purposes that can be selected when a .csv file is imported. For example, you can add an import purpose for the Employee data type. 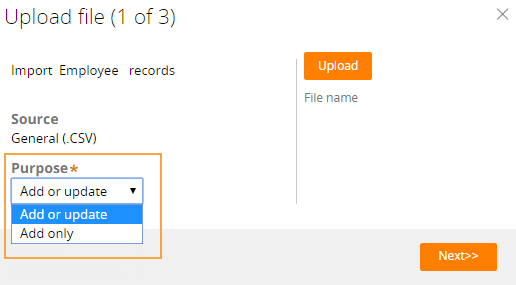 At run time, you select the import purpose and upload a .csv file in the Upload file step. In the Map fields step, when you map the Employee ID field in the Employee data type with the Staff ID field in the .csv file and click Next, the system passes the new import purpose and list of staff IDs in the .csv file to the activity. In the Map fields step, you can map the field in your data type that acts as a unique identifier with a field in the imported .csv file. The import process passes the new purpose and list of values for the uniquely mapped field in the .csv file to the activity that defines the logic for data import (pyCustomPostProcessing). Beginning with Pega 7.2.2, you can remove data import purposes. Override the pyLoadCustomImportPurposes data transform. Beginning with Pega 7.2.2, you can mark a data import purpose as a default choice. Set the value for the pyDefaultImportPurpose property to the import purpose that you want as the default selection. 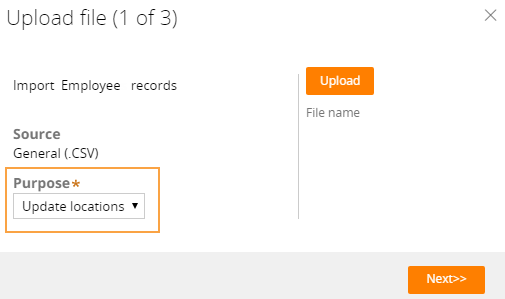 For example, if you set Update locations as the default import purpose, it is displayed as the default selection in the Purpose list of the Upload file step in the data import process. You can save time during data import if you update locations for your data type on a regular basis. You must set the value for the pyDefaultImportPurpose property to an existing import purpose. If the import purpose does not exist, the system displays Add or update as the default purpose. Beginning with Pega 7.2.2, you can prevent the selection of import purposes in the data import process. Set the value for the pyDisableImportPurpose property to true. When you set the value for the property to true, the system does not allow you to select an import purpose from the Purpose list of the Upload file step in the data import process. The default value in this list is Add or update or the value that you set for the pyDefaultImportPurpose property. For example, to allow only location updates for your data type, you can set the value for the pyDefaultImportPurposeproperty to UpdateLocations and the value for the pyDisableImportPurpose property to true.